For a heavenly Mission Beach breakfast, try our buttery brioche French toast slices filled with mountain berry cream cheese and crowned with fresh, ripe strawberries. 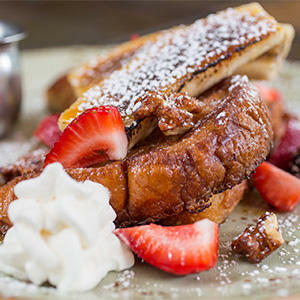 We serve our Stuffed French Toast with sausage patties and maple syrup – it's the best. Coffee, San Diego sunrise, a walk to the beach. Paradise. 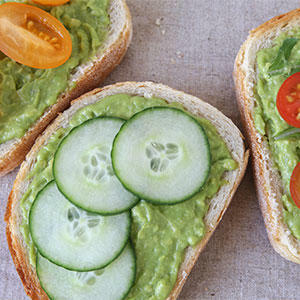 The Toastie is an open-faced sandwich layered with fresh avocado sprinkled with sea salt and cracked black pepper, thin slices of cucumber, arugula, heirloom tomatoes and applewood smoked bacon. A Swell Toastie and great coffee for lunch – another reason why we're one of the best coffee shops in San Diego. 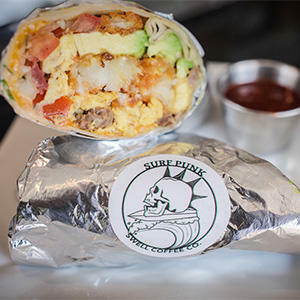 A signature Mission Beach breakfast, the Surf Punk Burrito takes scrambled eggs, cheeses, crisp tater tots, salsa fresca, avocado and bacon, carne asada or sausage and wraps it all in a huge flour tortilla. Our house pico cream sauce marries the flavors, but you'll be the one falling in love with the Surf Punk. Organic acai or organic pitaya (dragon fruit) are high on the list of superfoods. 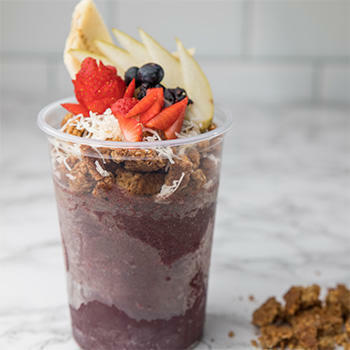 We pair them with fresh, seasonal fruit and serve with tropical Guarana, shredded coconut and our famous house-made granola. Relax and enjoy at our Mission Beach coffee shop or make it a grab-and-go breakfast, lunch, or snack. 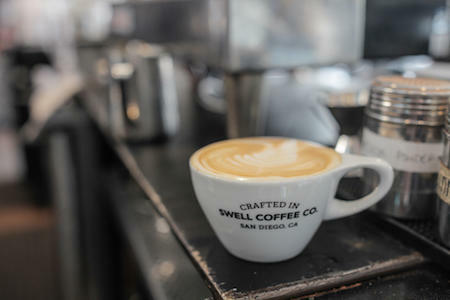 Swell Coffee Co. in Mission Beach has become a popular destination for anyone in search of a locally crafted cup of coffee and a casual breakfast or lunch made from top-quality ingredients. Families on vacation and local students stop by for food-to-go to enjoy by the beach, while others linger at tables in the relaxed outdoor seating area. 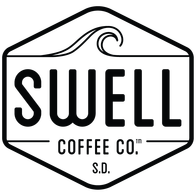 With our own boutique roasting company, Swell is committed to bringing customers the full-flavor experience of locally crafted coffee. We're also into promoting single-origin coffees from around the world. It's all about a community of quality, in the coffee we brew, the food we prepare and our friends here at the beach. ©2018 Swell Coffee Co. All rights reserved.